Objective Interleukin (IL)-7 is mainly produced in bone marrow (BM) that forms the niche for B cells. We previously demonstrated that BM also retains pathogenic memory CD4 T cells in murine models of inflammatory bowel disease (IBD). However, it remains unknown whether BM-derived IL-7 is sufficient for the development of IBD and which cells form the niche for colitogenic memory CD4 T cells in BM. Design To address these questions, we developed mice in which IL-7 expression was specific for BM, and identified colitis-associated IL-7-expressing mesenchymal stem cells (MSC) in the BM. Results IL-7–/–×RAG-1–/– mice injected with BM cells from IL-7+/+×RAG-1–/– mice, but not from IL-7–/–×RAG-1–/– mice, expressed IL-7 in BM, but not in their colon, and developed colitis when injected with CD4+CD45RBhigh T cells. Cultured BM MSC stably expressed a higher level of IL-7 than that of primary BM cells. IL-7-sufficient, but not IL-7-deficient, BM MSC supported upregulation of Bcl-2 in, and homeostatic proliferation of, colitogenic memory CD4 T cells in vitro. Notably, IL-7–/–×RAG-1–/– mice transplanted with IL-7-sufficient, but not IL-7-deficient, BM MSC expressed IL-7 in BM, but not in their colon, and developed colitis when transplanted with CD4+CD45RBhigh T cells. Conclusions We demonstrate for the first time that BM MSC are a major source of IL-7 and play a pathological role in IBD by forming the niche for colitogenic CD4 memory T cells in BM. IL-7 is mainly produced in BM. BM stromal cells forms the niche for B cells. We have previously reported that colitogenic memory CD4 T cells are retained in BM of IBD model mice in a IL-7-dependent manner. MSC have the ability to downmodulate inflammation and improve tissue repair, so their use to treat inflammatory diseases is being explored. IL-7–/–×RAG-1–/– mice injected with BM cells from IL-7+/+×RAG-1–/– mice, but not from IL-7–/–×RAG-1–/– mice, expressed IL-7 in BM, but not in the colon, and developed colitis when injected with CD4+CD45RBhigh T cells. BM MSC produced larger amount of IL-7 than that of primary BM cells. IL-7-sufficient, but not IL-7-deficient, BM MSC supported upregulation of Bcl-2 in, and homeostatic proliferation of, colitogenic memory CD4 T cells in vitro. IL-7–/–×RAG-1–/– mice transplanted with IL-7-sufficient, but not IL-7-deficient, BM MSC expressed IL-7 in BM, but not in the colon, and developed colitis when transplanted with CD4+CD45RBhigh T cells. The present study may be a new example for changing concepts of IBD from intestinal to systemic disease, and a therapeutic approach targeting BM MSC-derived IL-7 may be feasible in the treatment of chronic immune diseases. Inflammatory bowel disease (IBD) is characterised by chronic inflammation of the gastrointestinal tract. Accumulating evidence suggests that IBD is caused by an inappropriate response of the innate and acquired immune systems to commensal microbiota.1 Even if IBD enters remission as a result of treatment, it often relapses, leading to its lifelong duration. Therefore, we hypothesised that even in remission, colitogenic memory T cells survive for a long period as ‘pathogenic memory stem cells’2 ,3 in IBD patients. However, two important questions remain: whether BM-derived IL-7 is sufficient for the maintenance of colitogenic CD4 memory T cells in the absence of IL-7 produced at other sites, and which cells in BM mainly produce IL-7 and form the niche for colitogenic memory CD4 T cells. To address these questions, we established mice in which IL-7 expression is specific to BM, and attempted to identify the IL-7-expressing cells in BM. Although it is generally accepted that mesenchymal stem cells (MSC) have the ability to downregulate inflammation, and their use to treat inflammatory diseases is being explored, we propose a new hypothesis in which BM MSC,19–21 a candidate for the IL-7-producing stromal cells or their progenitors in BM, play a pathological role in the maintenance of colitogenic CD4 memory T cells. C57BL/6 mice were purchased from Japan CLEA (Tokyo, Japan). RAG-2-deficient mice (RAG-2–/–) were obtained from Taconic Laboratory (Hudson, New York, USA) and Central Laboratories for Experimental Animals (Kawasaki, Japan). RAG-1+/– and IL-7+/– mice on the C57BL/6 background were kindly provided by Dr Rose Zamoyska (National Institute for Medical Research, London, UK). These mice were intercrossed to generate RAG-1–/– and IL-7–/–×RAG-1–/– littermate mice. All mice are originally derived from C57BL/6 mice. Mice were maintained under specific pathogen-free conditions in the Animal Care Facility of Tokyo Medical and Dental University. Donors and recipients were used at 6–12 weeks of age. All experiments were approved by the regional animal study committees and performed according to institutional guidelines and Home Office regulations. See ‘more information’ in supplementary materials and methods (available online only) for details. We first assessed whether BM-derived IL-7 is sufficient for the development of colitis in the absence of IL-7 produced at other sites. To this end, we used a model of chronic colitis induced by the adoptive transfer of CD4+CD45RBhigh T cells into RAG-1–/– mice in combination with bone marrow transplantation (BMT) of donor BM cells from RAG-1–/– or IL-7–/–×RAG-1–/– littermate mice. First, RAG-1–/– and IL-7–/–×RAG-1–/– mice were treated with intraperitoneal busulfan and underwent total body irradiation to ablate their BM. The next day, mice were reconstituted with donor BM cells from RAG-1–/– or IL-7–/–×RAG-1–/– mice. Mice were divided into four groups as follows (figure 1A): IL-7–/–×RAG-1–/– mice transplanted with RAG-1–/– BM cells (IL-7+/+ → IL-7–/–); IL-7–/–×RAG-1–/– mice transplanted with IL-7–/–×RAG-1–/– BM cells (IL-7–/– → IL-7–/–); RAG-1–/– mice transplanted with RAG-1–/– BM cells (IL-7+/+ → IL-7+/+) and RAG-1–/– mice transplanted with IL-7–/–×RAG-1–/– BM cells (IL-7–/– → IL-7+/+). Four weeks after recovery from BMT, all groups of mice were injected intraperitoneally with CD4+CD45RBhigh T cells (figure 1A). As expected, IL-7+/+ → IL-7+/+ mice developed severe colitis. 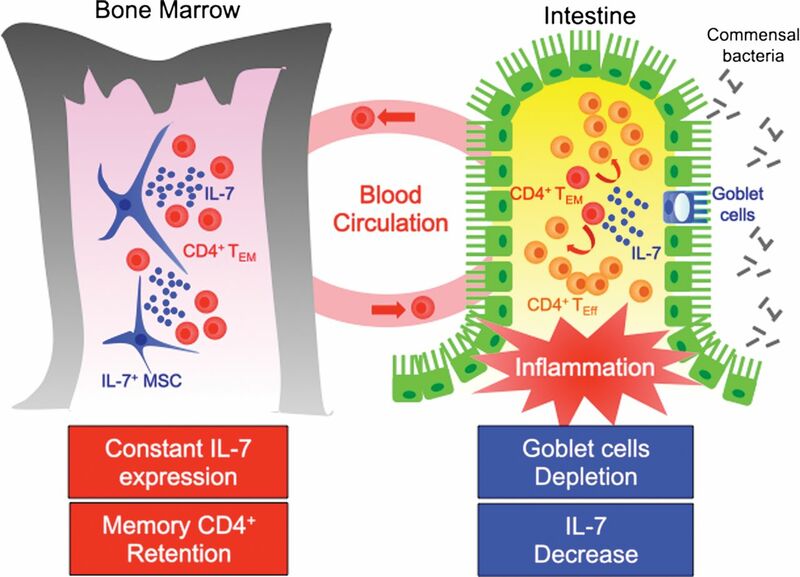 Interestingly, IL-7–/– → IL-7+/+ mice also developed colitis at a level similar to that of IL-7+/+ → IL-7+/+ mice (figure 1B–E), indicating that non-hematopoietic cells, including IL-7-producing BM stromal cells and/or BM stem cells that differentiated into IL-7-producing stromal cells, could not be completely ablated by the current busulfan/irradiation protocol. In contrast, IL-7–/– → IL-7–/– mice did not develop colitis because of the lack of IL-7 (figure 1B–E). However, to our surprise, the clinical findings revealed that IL-7+/+ → IL-7–/– mice injected with CD4+CD45RBhigh T cells developed a wasting disease and severe colitis to a similar extent to that of control IL-7+/+ → IL-7+/+ mice (figure 1B–E), indicating that the BMT protocol led to successful transplantation of IL-7-producing BM cells in IL-7+/+ → IL-7–/– mice. CD4+CD45RBhigh T-cell-injected IL-7–/–×RAG-1–/– recipients pretransplanted with bone marrow (BM) cells from IL-7+/+×RAG-1–/– mice develop colitis. (A) Experimental design. Mice were divided into four groups (n=8). Each group was injected intraperitoneally with CD4+CD45RBhigh T cells at 4 weeks after bone marrow transplantation. (B) Gross appearance of the colon, mesenteric lymph nodes and spleen (SP) from mice of each group at 10 weeks after cell administration. (C) Clinical scores determined at 10 weeks after administration as described in Materials and methods section. Data are shown as the mean±SEM for eight mice in each group, *p<0.01. (D) Histopathology of the distal colon of the indicated mice. Original magnification, ×200. (E) Histological scores. Data are shown as the mean±SEM for eight mice in each group, *p<0.05. (F) Absolute number of lamina propria (LP) CD3+CD4+ T cells from the colon. Data are shown as the mean±SEM. N.S., not significant, *p<0.01. (G) Cytokine production by LP CD4 T cells. LP CD4 T cells were isolated and stimulated in vitro. IFN-γ, TNFα and IL-17 concentrations in culture supernatants were measured by ELISA. Data are shown as the mean±SEM for eight mice in each group, *p<0.05. (H) Expression of IL-7 mRNA in colonic BM and the colon from the indicated mice as detected by reverse transcription PCR. (I) Frozen sections of BM and the colon from each mouse were stained with a polyclonal anti-IL-7 antibody. Original magnification ×400. A quantitative evaluation of T-cell expansion was performed by counting LP, spleen and BM CD4 T cells. While only a few CD4 T cells were recovered from all sites examined in IL-7–/– → IL-7–/– mice, approximately 100-fold higher numbers of LP, spleen and BM CD4 T cells were recovered from IL-7+/+ → IL-7–/–, IL-7+/+ → IL-7+/+ and IL-7–/– → IL-7+/+ mice (figure 1F). In addition, on in-vitro stimulation, LP CD4 T cells from IL-7+/+ → IL-7–/–, IL-7+/+ → IL-7+/+ and IL-7–/– → IL-7+/+ mice produced equal and significantly higher amounts of interferon (IFN)-γ, tumour necrosis factor (TNF)α and IL-17 than those from IL-7–/– → IL-7–/– mice (figure 1G). Flow cytometric analysis revealed that the CD4 T cells isolated from the LP, mesenteric lymph nodes, spleen and BM of all recipients at 8 weeks after transfer of CD4+CD45RBhigh T cells had a characteristic CD69+IL-7Rαhigh phenotype (see supplementary figure S1, available online only), indicating that the transferred CD4+CD45RBhigh T cells differentiated into activated TEM cells irrespective of the presence of IL-7. 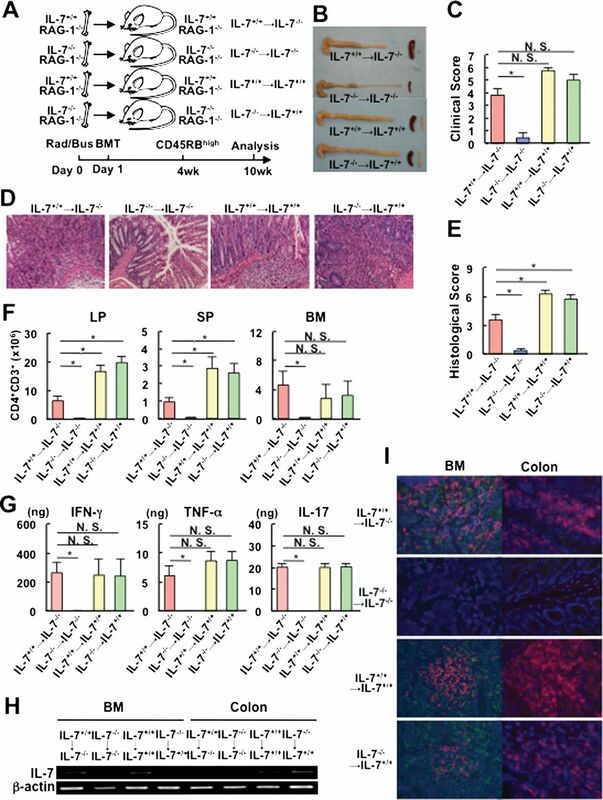 These results suggest that BM-derived IL-7 promotes the development and persistence of colitis primarily by supporting the expansion of colitogenic CD4 TEM cells in the colon. We performed highly sensitive reverse transcription PCR for the detection of IL-7 messenger RNA using samples obtained from the BM and colon. As shown in figure 1H, IL-7 mRNA was detected in the BM of IL-7+/+ → IL-7–/–, IL-7+/+ → IL-7+/+ and IL-7–/– → IL-7+/+ mice with colitis, but not in that of IL-7–/– → IL-7–/– mice without colitis. Of note, IL-7 mRNA was detected in the LP of IL-7+/+ → IL-7+/+ and IL-7–/– → IL-7+/+ mice, but not in IL-7+/+ → IL-7–/– or IL-7–/– → IL-7–/– mice regardless of the development of colitis, indicating that after BMT, IL-7+/+ BM cells led to the establishment of IL-7-producing stromal cells in BM. Consistent with this result, immunohistochemistry revealed that IL-7 was in the BM of IL-7+/+ → IL-7–/–, IL-7+/+ → IL-7+/+ and IL-7–/– → IL-7+/+ mice with colitis, but not in IL-7–/– → IL-7–/– mice without colitis (figure 1I). However, IL-7 protein was not detected in any group regardless of the presence of colitis by immunohistochemistry, indicating that IL-7-producing goblet cells were depleted in the inflamed mucosa of colitic mice, a phenomenon known as ‘goblet depletion’ in the pathology of human IBD.12 Collectively, these data suggest that BM-derived stem cells become established in the BM after BMT and thereafter produce IL-7. As shown in figure 1I, IL-7-producing cells were colonised in the BM, but not in the colon of IL-7+/+ → IL-7–/– mice even at 10 weeks after BMT, suggesting that the BM cells of RAG-1−/− mice include some progenitors of IL-7-producing cells, which preferentially migrate to the BM. BM cells include not only haematopoietic stem cells, which can differentiate into granulocytes, macrophages, natural killer cells, B cells, T cells and other haematopoietic cells, but also MSC, which can differentiate into adipose tissue, cartilage, bone and other mesenchymal tissues, and both stem cells preferentially migrate to the BM after BMT.20 Because it is well known that IL-7 is not secreted from haematopoietic cells, but from stromal cells in BM, we hypothesised that MSC are the progenitors of IL-7-producing cells in BM. To test this hypothesis, we cultured MSC derived from the BM of RAG-1–/– and IL-7–/– ×RAG-1–/– mice using a current standard protocol.21 First, IL-7 mRNA expression in cultured MSC at passages 0–40 was assessed by real-time PCR. Surprisingly, MSC derived from the BM of RAG-1–/– mice (IL-7+/+ MSC), but not from IL-7–/–×RAG-1–/– mice (IL-7–/– MSC), strongly expressed IL-7 mRNA at passages 1–40, which peaked at passage 5 (figure 2A). Furthermore, a substantial proportion of cultured IL-7+/+ MSC, but not IL-7−/− MSC, expressed IL-7 protein that was detected by immunohistochemistry (figure 2B). MSC derived from both RAG-1–/– and IL-7–/– ×RAG-1–/– mice expressed MSC markers Sca-1, CD140a, CD73 and CD105, but not haematopoietic markers CD11b, Gr-1, TER119, CD3, CD45 and CD34 or endothelial markers CD146, FLK1 and VEGFR3 (see supplementary figure S2, available online only). In contrast, whole BM cells from RAG-1–/– and IL-7–/– ×RAG-1–/– mice included various types of haematopoietic cells (see supplementary figure S2, available online only). We confirmed that these cultured BM MSC had the ability to differentiate into three mesenchymal lineages: adipocytes, osteocytes and chondrocytes (figure 2D). 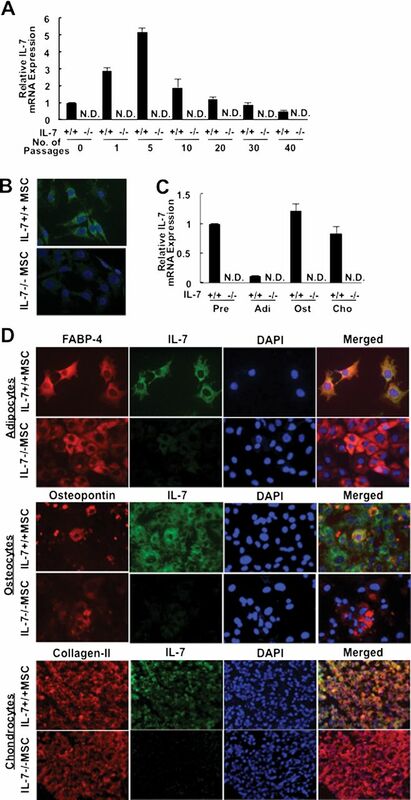 Importantly, IL-7+/+ MSC and IL-7+/+ MSC-derived adipocytes, osteocytes and chondrocytes expressed IL-7 mRNA in sharp contrast to that of cells derived from IL-7–/– mice (figure 2C). This result was also confirmed by immunohistochemistry analysis (figure 2D). We thus identified MSC not only as the progenitors of IL-7-producing cells, but also the highly IL-7-producing cells in BM. Bone marrow (BM) mesenchymal stem cells (MSC) from IL-7+/+×RAG-1–/– mice express IL-7 mRNA and protein. (A) Expression of IL-7 mRNA in IL-7+/+ and IL-7–/– MSC at various passages and in freshly isolated BM cells from RAG-1–/– (IL-7+/+ BM cells) and IL-7–/–×RAG-1–/– (IL-7–/– BM cells) mice were determined by real-time PCR. Data are relative mIL-7 expression levels in MSC at each passage compared with that in IL-7+/+ BM cells. (B) Adherent monolayer of cultured MSC stained with a polyclonal anti-IL-7 antibody. Original magnification ×400. (C) Real-time PCR was performed to check the expression of IL-7 mRNA in differentiated tissues derived from IL-7+/+ and IL-7–/– MSC. Data are relative mIL-7 expression levels in each differentiated cell type compared with that in IL-7+/+ pre-MSC. (D) Adherent monolayer of differentiated tissues derived from IL-7+/+ and IL-7–/– MSC were stained with anti-FABP-4, anti-osteopontin, anti-collagen-II (all red) and anti-IL-7 (green) antibodies and DAPI (blue). Original magnification ×400. Given the evidence of IL-7+/+ BM MSC that express high levels of IL-7, we next assessed the role of BM MSC in the maintenance of colitogenic CD4 memory T cells in vitro. First, we attempted to confirm the hallmark character of the immunosuppressive ability of MSC.19 To this end, CD4+CD25− T cells isolated from the spleen of wild-type mice were labelled with carboxyfluorescein diacetate succinimidyl ester (CFSE), and then co-cultured with IL-7+/+ or IL-7−/− MSC in the presence of an anti-CD3 antibody and mitomycin-C-treated CD4 negative cells, which are used as antigen presenting cells. At 4 days after co-culture, CD4+CD25− T cells were collected and analysed (see supplementary figure S3A, available online only). Both IL-7+/+ and IL-7−/− MSC suppressed the proliferation of responder T cells, while those cultured without MSC proliferated extensively (see supplementary figure S3B–D, available online only). We next conducted long-term co-culture with colitogenic CD4 TEM cells and MSC to assess the ability of MSC to support memory CD4 T cells (figure 3). CFSE-labelled CD4 T cells isolated from colonic LP of colitic RAG-2–/– mice, which had been pre-injected with CD4+CD45RBhigh T cells, were incubated with IL-7+/+ or IL-7–/– MSC, or in conditioned medium alone (figure 3A), and CFSE was evaluated after 4 weeks of culture. The absolute number of surviving CD3+CD4+ T cells that were co-cultured with IL-7+/+ MSC was significantly higher than that of the other groups (figure 3B). Consistently, CD4 T cells co-cultured with IL-7+/+ MSC slowly divided up to five times in 4 weeks, suggesting that these cells were quiescent and divided intermittently, much like homeostatic proliferation in vivo.22 In sharp contrast, CD4 T cells co-cultured with IL-7–/– MSC or cultured in medium alone did not proliferate (figure 3C). Furthermore, the expression of Bcl-2 in CD4 T cells co-cultured with IL-7+/+ MSC was significantly higher than that in other groups (figure 3D, E). These results indicate that IL-7+/+ MSC support not only homeostatic proliferation but also the survival of colitogenic CD4 TEM cells in a manner dependent on IL-7-producing MSC. To exclude the possibility that these activities of IL-7+/+ MSC are mediated by secondary effects, rather than their production of IL-7, we performed an IL-7-blocking experiment. As shown in figure 3F–H, the ability of IL-7+/+ MSC to support colitogenic CD4 TEM cells was almost completely abrogated by an IL-7-blocking antibody (figure 3F–H). IL-7+/+, but not IL-7–/–, mesenchymal stem cells (MSC) induce extensive proliferation of colitogenic CD4 T cells in vitro. (A) Experimental design. Colitogenic memory CD4 T cells were isolated from colonic lamina propria (LP) of colitic RAG-2–/– mice re-injected with CD4+CD45RBhigh T cells, and labelled with CFSE. CFSE-labelled colitogenic memory CD4 T cells (1×106) were then co-cultured with IL-7+/+ or IL-7–/– MSC. CFSE-labelled memory CD4 T cells were incubated in conditioned medium as a negative control. (B) Cell counts of recovered CD3+CD4+ cells were performed by flow cytometry. Data are shown as the mean±SEM of six samples in each group, *p<0.05. (C) After 4 weeks of co-culture, CFSE in memory CD4 T cells was evaluated by flow cytometry. Representative data of six samples are shown. (D) Intracellular staining of Bcl-2 in colitogenic CD4 TEM cells in each group. Colitogenic CD4 TEM cells were co-cultured with IL-7+/+ or IL-7–/– MSC, or incubated in conditioned medium alone. (E) Mean fluorescence intensity of Bcl-2 in CD3+CD4+ cells in each group. Data are shown as the mean±SEM. (F) Experimental design. Colitogenic memory CD4 T cells were isolated from colonic LP of colitic RAG-2–/– mice pre-injected with CD4+CD45RBhigh T cells, and labelled with CFSE. CFSE-labelled colitogenic memory CD4 T cells (1×106) were co-cultured with IL-7+/+ MSC in medium containing a polyclonal anti-IL-7 antibody or isotype control IgG. CFSE-labelled memory CD4 T cells were co-cultured with IL-7–/– MSC as a negative control. (G) Cell counts of recovered CD3+CD4+ cells were performed by flow cytometry. Data are shown as the mean±SEM of three samples in each group, *p<0.05. (H) After 4 weeks of co-culture, CFSE in memory CD4 T cells was detected by flow cytometry. Representative data for six samples are shown. We next conducted an adoptive transfer experiment in conjunction with the transplantation of BM MSC. First, we checked whether cultured MSC could migrate to the BM, spleen and colon, because it is unknown whether these cultured MSC traffic to the same organs compared with those of freshly isolated MSC.20 IL-7+/+ MSC were transferred to IL-7–/– ×RAG-1–/– mice without the busulfan/irradiation protocol that was used in the previous BMT experiment. At 1, 2 and 4 weeks after the transfer, the expression of IL-7 mRNA and protein in the BM, spleen and colon of recipient mice was determined (figure 4A). As shown in figure 4B and C, at each time point, IL-7 mRNA and protein was detected in the BM, but not in the spleen or colon. Time course analysis of IL-7 expression in the bone marrow (BM), spleen and colon of IL-7–/–×RAG-1–/– mice pre-injected with IL-7+/+ mesenchymal stem cells (MSC). (A) Experimental design. IL-7–/–×RAG-1–/– mice were injected intravenously with IL-7+/+ MSC. At 1, 2 and 4 weeks after the transfer, the BM, spleen (SP) and colon of the mice were collected and checked for the expression of IL-7. (B) IL-7 mRNA expression in the BM, spleen and colon at each time point as assessed by quantitative reverse transcription PCR. (C) IL-7 protein expression in the BM, spleen and colon at each time point as assessed by immunohistochemistry. IL-7 (green) and DAPI (blue). Given the evidence of IL-7-producing MSC that migrate to the BM, 1×106 IL-7+/+ or IL-7–/– MSC were transplanted into IL-7–/–×RAG-1–/– mice. At 4 weeks after transplantation, CD4+CD45RBhigh T cells were injected into the pretransplanted mice (figure 5A). At 6 weeks after transfer, the colon from IL-7+/+ MSC-transplanted mice, but not that from IL-7–/– MSC-transplanted mice, was enlarged and had a greatly thickened wall (data not shown). Overall, the assessment of colitis by clinical scoring showed a clear difference between mice that received IL-7+/+ or IL-7–/– MSC (figure 5B). This result was confirmed by histological examination of multiple colon sections (figure 5C, D). The absolute number of CD3+CD4+ T cells recovered from the BM, spleen and LP of IL-7+/+ MSC-transplanted mice was significantly higher than that from IL-7–/– MSC-transplanted mice (figure 5E). Flow cytometric analysis revealed that CD4 T cells isolated from the BM, spleen and LP of IL-7+/+ MSC-transplanted mice at 6 weeks after transfer of CD4+CD45RBhigh T cells had a characteristic CD44+ CD62L−CD69+IL-7Rαhigh effector memory phenotype (see supplementary figure. S4, available online only). Furthermore, on in-vitro stimulation, LP CD4 T cells from IL-7+/+ MSC-transplanted mice produced significantly higher amounts of IFN-γ, TNFα and IL-17 than those from IL-7–/– MSC-transplanted mice (figure 5F). More importantly, IL-7 mRNA and protein were detected in the BM, but not the colon, of IL-7+/+ MSC-transplanted mice, and not in either the BM or colon of IL-7–/– MSC-transplanted mice (figure 5G, H). We further compared the number of MSC transplanted into this colitis model, and found that transplantation of 1×106 MSC, but not 1×105 or 1×104 MSC, induced colitis in terms of the clinical score, histology, absolute number of recovered LP CD4 T cells, and cytokine expression (see supplementary figure S5A–H, available online only). This result suggested that insufficient numbers of MSC appropriately migrated to induce colitis because of the loss of their homing receptors during culture. CD4+CD45RBhigh T-cell-injected IL-7–/–×RAG-1–/– mice pretransplanted with IL-7+/+, but not IL-7–/–, mesenchymal stem cells (MSC) develop colitis. (A) Experimental design. Mice were divided into two groups (n=5). Each group was injected intraperitoneally with CD4+CD45RBhigh T cells at 4 weeks after MSC transfer. (B) Clinical scores. Data are shown as the mean±SEM for five mice in each group, *p<0.05. (C) Histological results for the colons of each group. Original magnification ×200. (D) Histological scores. Data are shown as the mean±SEM for five mice in each group, *p<0.05. (E) Absolute number of lamina propria (LP) CD3+CD4+ T cells from the colon at 10 weeks after transfer. Data are shown as the mean±SEM. N.S. not significant, *p<0.01. (F) Cytokine production by LP CD4 T cells stimulated in vitro. IFN-γ, TNFα and IL-17 concentrations in culture supernatants were measured by ELISA. Data are shown as the mean±SEM for five mice in each group, *p<0.05. (G) Expression of IL-7 mRNA in the bone marrow (BM) and LP of IL-7+/+ MSC- or IL-7–/– MSC-transplanted mice as measured by reverse transcription PCR. (H) Expression of IL-7 protein in the BM and LP of each group of mice as detected by immunohistochemistry. In addition to the above results, BM MSC have been identified as progenitors of mesenchymal tissues because they can migrate to injured tissues to repair them.21 Therefore, transplantation of BM MSC for tissue repair has been proposed based on their stem cell qualities observed in animal models of IBD. In fact, Duijvestein et al23 recently reported the feasibility of autologous BM MSC for the treatment of patients with refractory Crohn's disease. Moreover, recent studies suggest that MSC play a second role in inducing peripheral tolerance by inhibiting the release of proinflammatory cytokines and interacting with various kinds of immune cells.19 Therefore, we checked whether our cultured MSC could suppress colitis when they were transferred together with CD4+CD45RBhigh T cells to RAG-2–/– mice as a preventive protocol. Mice were divided into four groups as follows: RAG-1–/– mice injected with CD4+CD45RBhigh T cells and IL-7+/+ MSC (IL-7+/+ MSC); RAG-1–/– mice injected with CD4+CD45RBhigh T cells and IL-7–/– MSC (IL-7–/– MSC); RAG-1–/– mice injected with CD4+CD45RBhigh T cells (RBhigh) as a positive control; and RAG-1–/– mice injected with CD4+CD45RBhigh T cells and CD4+CD25+ T cells (RBhigh+Treg) as a negative control (figure 6A). Both IL-7+/+ MSC and IL-7–/– MSC groups developed a wasting disease and colitis with a thickened colon and splenomegaly to the same extent as that in the RBhigh group, while the RBhigh+Treg-negative control group gained weight and did not develop colitis (figure 6B–F). A large number of LP CD4 T cells was recovered from IL-7+/+ MSC, IL-7–/– MSC, and RBhigh groups, while only a small number of LP CD4 T cells was recovered from the RBhigh+Treg group (figure 6G). As shown in figure 6H, on in-vitro stimulation, LP CD4 T cells from IL-7+/+ MSC, IL-7–/– MSC and RBhigh groups produced equal and significantly higher amounts of IFN-γ, TNFα and IL-17 than those by the RBhigh+Treg group. These data indicated that, at least in our present in-vivo model, neither IL-7+/+ MSC nor IL-7–/– MSC could suppress the development of colitis, even when they were transferred in combination with CD4+CD45RBhigh T cells. Although we performed multiple injections of IL-7+/+ and IL-7−/− MSC to suppress colitis and evaluate a therapeutic effect, colitis could not be suppressed in terms of clinical and histological scores, the number of infiltrated LP CD4 T cells and cytokine production (see supplementary figure S6A–G, available online only). CD4+CD45RBhigh T-cell-injected RAG-1–/– recipients pre-injected with either IL-7+/+ or IL-7–/– mesenchymal stem cells (MSC) develop colitis. (A) Experimental design. Mice were divided into four groups as follows: RAG-1–/– mice that were pre-injected with CD4+CD45RBhigh T cells and IL-7+/+ MSC (n=3, IL-7+/+ MSC); RAG-1–/– mice that were pre-injected with CD4+CD45RBhigh T cells and IL-7–/– MSC (n=3, IL-7–/– MSC); RAG-1–/– mice that were pre-injected with CD4+CD45RBhigh T cells (n=3, RBhigh cells); and RAG-1–/– mice that were pre-injected with CD4+CD45RBhigh T cells and CD4+CD25+ T cells (n=3, RBhigh + Treg cells). (B) Percentage of the initial body weight (BW) of each group. Data are shown as the mean±SEM for three mice in each group, *p<0.05. (C) Representative gross appearance of the spleen, mesenteric lymph nodes and colon of each group. (D) Clinical scores. Data are shown as the mean±SEM for three mice in each group, *p<0.05. (E) Histological scores. Data are shown as the mean±SEM for three mice in each group, *p<0.05. (F) Histopathology of the distal colon of the indicated mice at 6 weeks after transfer. Original magnification, ×40 upper panel and ×200 lower panel. (G) Absolute number of lamina propria (LP) CD3+CD4+ T cells from the colon at 6 weeks after transfer. Data are shown as the mean±SEM. N.S. not significant, *p<0.01. (H) Cytokine production by LP CD4 T cells. LP CD4 T cells were isolated at 6 weeks after transfer and stimulated with anti-CD3 and anti-CD28 antibodies for 48 h. IFN-γ, TNFα and IL-17 concentrations in culture supernatants were measured by ELISA. Data are shown as the mean±SEM for three mice in each group, *p<0.05. BM MSC have previously been identified as progenitors of mesenchymal tissues by migrating to injured tissues to repair them,19–21 and transplantation of BM MSC for tissue repair has been proposed based on their stem cell qualities. Moreover, recent studies suggest that cultured MSC play a second role in the induction of peripheral tolerance by inhibiting the release of proinflammatory cytokines and interacting with various kinds of immune cells. However, the present study clearly shows that: (1) BM MSC produce IL-7; (2) MSC have the potential to support the proliferation and survival of colitogenic CD4 TEM cells; and notably (3) transplantation of BM MSC into IL-7–/–×RAG-1–/– mice induces colitis when the mice are later injected with CD4+CD45RBhigh T cells; and (4) IL-7 expression is maintained in the BM of IL-7–/–×RAG-1–/– mice transplanted with BM MSC. The present study thus suggests the possible participation of IL-7-producing BM MSC as niche cells to maintain colitogenic CD4 memory T cells. Although it is possible that IL-7 produced in BM leads to levels of circulating IL-7 that support local (intracolonic) expansion of T-cell populations, rather than facilitating the formation of a niche in BM for these cells, we previously demonstrated that intrarectally administered colitogenic CD4 T cells surprisingly egress to the colon, migrate to BM.18 In addition, we have reported that IL-7−/−×RAG-1−/− host mice combined with colitic RAG-2−/− donor mice as a parabiosis develop colitis without IL-7 expression in any organ.12 Therefore, we concluded that colitogenic memory CD4 T cells as ‘memory stem cells’ may be supported in some specific niche, such as BM, in which IL-7 is abundant even when in the acute phase of colitis. 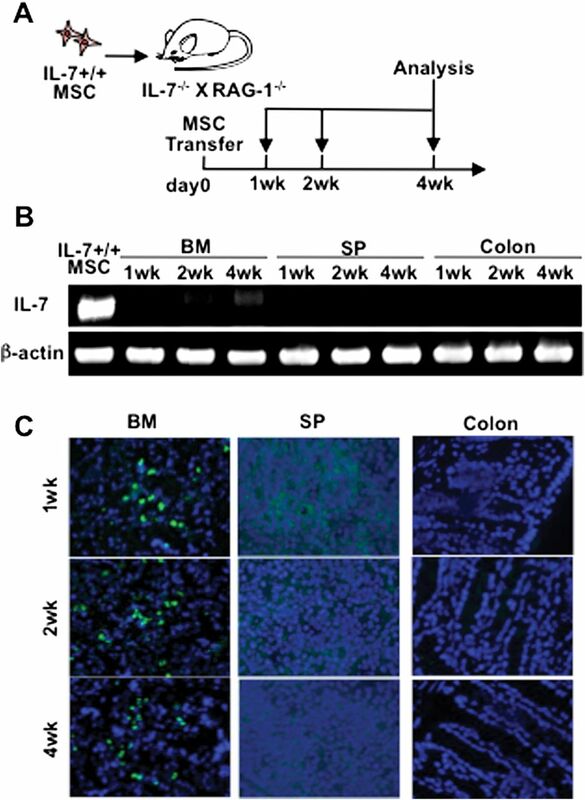 Because we used IL-7 as a marker of MSC in this setting, it is possible that transferred MSC can spread to many tissues including inflamed colonic mucosa to become differentiated cells but lose expression of IL-7. However, it remains unknown why IL-7 was not detected in the inflamed colon of IL-7−/−×RAG-1−/− mice after transfer of IL-7+/+ MSC with CD4+CD45RBhigh T cells, although MSC-derived adipocytes that expressed IL-7 could not be detected (figure 2C,D). Nevertheless, it is noteworthy that IL-7 production by the transferred MSC was maintained only in the BM regardless of their differentiation status. Therefore, we propose that, in addition to the two major roles previously reported, namely tissue repair19–21 and immune suppression,19 ,20 BM MSC-derived IL-7 is positively involved in the perpetuation of chronic inflammatory diseases by forming the niche for pathogenic CD4 memory T cells in BM (figure 7). Although many differences exist between our colitis model induced by a lymphopenic driver, other murine models, such as dextran sodium sulfate-induced acute colitis model, and human IBD, we propose a pathological role of IL-7-producing MSC at least in our model. Furthermore, the present study supports a conceptual change of IBD from an intestinal to a systemic disease, and suggests therapeutic approaches that target BM MSC-derived IL-7 for the treatment of IBD. Model for the maintenance of colitogenic CD4 TEM cells by bone marrow (BM) mesenchymal stem cell (MSC)-derived IL-7. BM MSC-derived IL-7 plays a role in the maintenance of colitogenic CD4 TEM cells, and may be a clinical target for the treatment of inflammatory bowel diseases. From a clinical viewpoint, we have previously demonstrated that IL-7 protein in the serum of patients with ulcerative colitis (UC) is higher than that in healthy controls.24 Furthermore, IL7R has previously been identified as one of the disease susceptibility genes of UC.25 Therefore, it may be interesting to compare the IL-7 levels in BM, especially in BM MSC, between IBD patients and healthy controls to determine whether BM MSC are responsible for IL-7 production in the pathogenesis of human UC, and a strategy targeting IL-7 might be a feasible clinical approach for the treatment of UC. Furthermore, the current approach for the induction of remission (the acute stage of the disease) using autologous or allogeneic MSC in patients with intractable UC would be considered based on the present finding that MSC may play a pathological role in the maintenance of colitogenic memory T cells (remission stage). However, we would like to emphasise that the present results are consistent with the current concept of using MSC to treat human IBD in ongoing clinical trials, because we also confirmed that our cultured MSC suppressed the proliferation of CD4 T cells in the short-term culture system. Finally, it should be emphasised that the strategy of IL-7 blockade is at an immature stage at this time, because IL-7 is essential not only for colitogenic CD4 T cells but also protective memory CD4 T cells such as regulatory T cells. Therefore, further investigation in this field is warranted. Overall, in support of previous evidence that BM is a reservoir organ for CD4 memory T cells, we demonstrated for the first time that BM MSC express IL-7 and comprise the key population that forms the niche for colitogenic memory CD4 T cells and causes the persistence of chronic colitis. The authors are grateful to R. Zamoyska for providing the mice used in this study.
. Unravelling the pathogenesis of inflammatory bowel disease. Nature 2007;448:427–34.
. A human memory T cell subset with stem cell-like properties. Nat Med 2011;17:1290–7.
. Persistent retention of colitogenic CD4+ memory T cells causes inflammatory bowel diseases to become intractable. Inflamm Bowel Dis 2009;5:926–34.
. T cell memory. Annu Rev Immunol 2002;20:551–79.
. Interleukin 7 and T cell receptor signals regulate homeostasis of CD4 memory cells. Nat Immunol 2003;4:680–6.
. Cytokine control of memory T-cell development and survival. Nat Rev Immunol 2003;3:269–79.
. Stimulation of B-cell progenitors by cloned murine interleukin-7. Nature 1988;333:571–3.
. Interleukin 7 is produced by human intestinal epithelial cells and regulates the proliferation of intestinal mucosal lymphocytes. J Clin Invest 1995;95:2945–53.
. Interleukin 7 transgenic mice develop chronic colitis with decreased interleukin 7 protein accumulation in the colonic mucosa. J Exp Med 1998;187:389–402.
. Mucosal T cells expressing high levels of IL-7 receptor are potential targets for treatment of chronic colitis. J Immunol 2003;171:1556–63.
. IL-7 is essential for the development and the persistence of chronic colitis. J Immunol 2007;178;4737–48.
. Systemic, but not intestinal, IL-7 is essential for the persistence of chronic colitis. J Immunol 2008;180:383–90.
. Intestinal lamina propria retaining CD4+CD25+ regulatory T cells is a suppressive site of intestinal inflammation. J Immunol 2007;178:4937–46.
. The bone marrow: a nest for migratory memory T cells. Trends Immunol 2005;26:360–6.
. Organization of immunological memory by bone marrow stroma. Nat Rev Immunol 2010;10:193–200.
. Bone marrow retaining colitogenic CD4+ T cells may be a pathogenic reservoir for chronic colitis. Gastroenterology 2007;132;176–89.
. Long-lived colitogenic CD4+ memory T cells residing outside the intestine participate in the perpetuation of chronic colitis. J Immunol 2009;183:5059–68.
. Luminal CD4+ T cells penetrate gut epithelial monolayers and egress from lamina propria to blood circulation. Gastroenterology 2011;141:2130–9.
. Mesenchymal stem cells in health and disease. Nat Rev Immunol 2008;8:726–36.
. Mesenchymal stem cell homing: the devil is in the details. Cell Stem Cell 2009;4:206–16.
. Mesenchymal stem cells are recruited into wounded skin and contribute to wound repair by transdifferentiation into multiple skin cell type. J Immunol 2008;180:2581–7.
. Antigen-independent memory CD8 T cells do not develop during chronic viral infection. Proc Natl Acad Sci U S A 2004;101:16004–9.
. Autologous bone marrow-derived mesenchymal stromal cell treatment for refractory luminal Crohn's disease: results of a phase I study. Gut 2010;59:1662–9.
. The serum factor from patients with ulcerative colitis that induces T cell proliferation in the mouse thymus is interleukin-7. J Clin Immunol 1997;17:282–92.
. Deep resequencing of GWAS loci identifies independent rare variants associated with inflammatory bowel disease. Nat Genet 2011;43:1066–73. Contributors YN helped to design the study, performed experiments, analysed the data, and wrote the paper; TK conceived and designed the study, analysed the data, and wrote the paper; MT performed experiments; SO, TN, RO and KT helped to design the study and MW supervised the study. Funding This study was supported in part by grants-in-aid for scientific research, scientific research on priority areas, exploratory research and creative scientific research from the Japanese Ministry of Education, Culture, Sports, Science and Technology; the Japanese Ministry of Health, Labour and Welfare; the Japan Medical Association; the Foundation for Advancement of International Science; the Terumo Life Science Foundation; the Ohyama Health Foundation; the Yakult Bio-Science Foundation; the Research Fund of the Mitsukoshi Health and Welfare Foundation; and the Japan Intractable Disease Research Foundation. Mesenchymal stromal cells in inflammatory bowel disease: conspirators within the ‘colitogenic niche’?